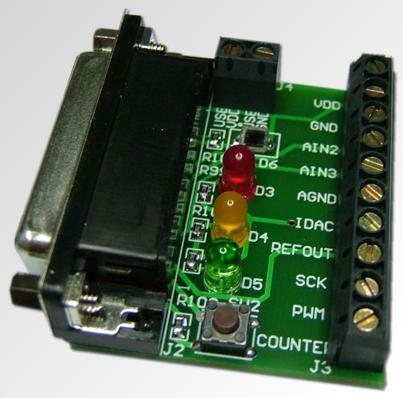 The Light Application Adaptor is used for the teaching or demonstrating of PC or smartphone Based Data Acquisition and Control. Used with the EMANT300 USB Data Acquisition Module or the EMANT380 Bluetooth Wireless Data Acquisition Module, they form a very low cost DAQ teaching kit. It is ideal for use in hands-on teaching laboratories. Screw Terminals for connecting other sensors and actuators directly for additional experiments like measuring pressure and strain. Examples programs using National Instrument's LabVIEW, the Microsoft .NET languages (C#, VB or VC++) or Open Source Python are included. Plus instructions on how to build a light intensity logger.